Western bean cutworm is a pest of dry beans and corn that first migrated into Michigan from the western United States in 2006. Adult western bean cutworm moths emerge from the soil in July and early August to mate, laying their eggs on the leaves of dry bean and corn plants. In years when corn has yet to tassel during western bean cutworm flight, eggs masses are first deposited in corn before the moths eventually move on to dry beans. If corn has already tasseled when the moths emerge, as was the case this year, they tend to lay eggs mostly in dry beans. Once hatched, developing larvae feed on the silks and young ears of corn, or the blossoms, pods and immature seeds of dry beans, ultimately reducing crop yield and quality. Michigan State University Extension Presque Isle County has monitored western bean cutworm flight through pheromone trapping since 2013. This year, we recruited six local producers to participate in the Western Bean Cutworm Trap Network managed by the Canadian Corn Coalition. 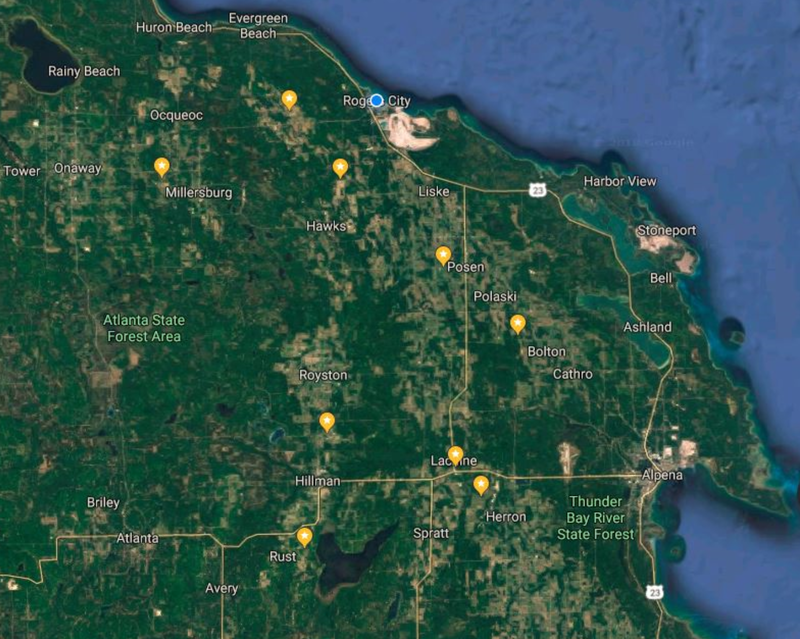 Nine pheromone trapping sites were established in Millersburg, Moltke, Hawks, Posen, Bolton, Lachine, Heron, Hillman and Rust, Michigan, adjacent to dry bean and corn fields (Photo 1). View an interactive map of all sites participating in the 2018 Western Bean Cutworm Trap Network. Traps have been checked weekly from July 11–30, and we will continue monitoring until Aug. 15. On July 30, four of our nine monitoring sites rapidly surpassed the cumulative threshold of 150 moths established for Michigan dry beans (Table 1). Moth counts at these locations are already two to 3.5 times the previous record number we observed in 2016, and trapping will continue for another two weeks. We suspect at least two other sites (Hillman and Rust) will likely reach threshold before monitoring is complete. Table 1. Western bean cutworm moths trapped at monitoring sites since July 11, 2018. Western bean cutworm flight has historically peaked during the second week of August in northeast Lower Michigan. Once deposited, egg masses hatch in five to six days. In areas where trap counts reach threshold, scout dry bean fields during the second and third weeks of August for feeding injury on blossoms and pods. Observing western bean cutworm larvae directly is difficult because they are mostly active at night. Scouting for this pest is particularly important because high moth numbers in pheromone traps may not directly translate to lots of eggs and larvae in the field, particularly in a dry year when female moths can struggle to survive and produce eggs. Western bean cutworm flight, egglaying and damage is also quite variable across the landscape and can be patchy within fields, which makes careful scouting critical. Factors that seem to contribute to higher western bean cutworm moth numbers include susceptible crops in rotation (corn and dry beans), dry weather and coarse soil texture. Dry bean growers must consider their market and tolerance for damage when deciding whether or not an insecticide application to control western bean cutworm is justified. Insecticide applications should be timed to control the bulk of larvae shortly after they hatch, usually about a week after peak flight. As always, applicators need to follow label instructions, including pre-harvest intervals. Many insecticides effective against western bean cutworm are restricted use pesticides requiring an applicator license to purchase and apply. Insecticides can also kill non-target and beneficial insects, which may cause secondary problems, as in the case of flaring spider mite infestations by removing their natural predators.